Back in the late 80s and early 90s when user interfaces where not as intuitive as they are today, effective use of software depended on the quality of user manuals. Yet, at software company TCS, manuals were written by programmers and therefore looked more like technical specifications documents. There was no way folks at banks, retail shops, and factories were going to understand them and use them. 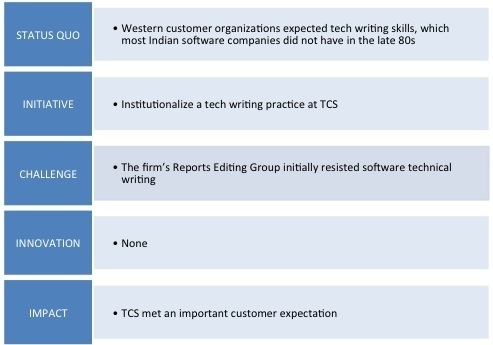 They were so bad that Pradeep Henry was told a conspiracy theory – software companies in India produced poor manuals so they could charge the customers for user-training and customer support. Like most conspiracy theories this too was mere speculation. The real reason was that most software companies in India simply did not have the method or skills to create manuals that users could use. Despite challenges, Henry set up a tech writing practice at TCS. 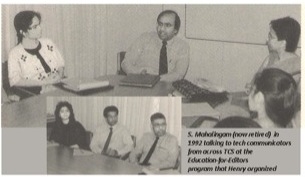 The initiative included several actions including the training that Henry organized for TCS' editors from various offices (picture above). What was the impact? Users at customer organizations got better manuals. And colleagues, including those who resisted change, became very successful. Today, some of them run large writing/content business units at multibillion-dollar firms, while some even run their own tech writing firms.